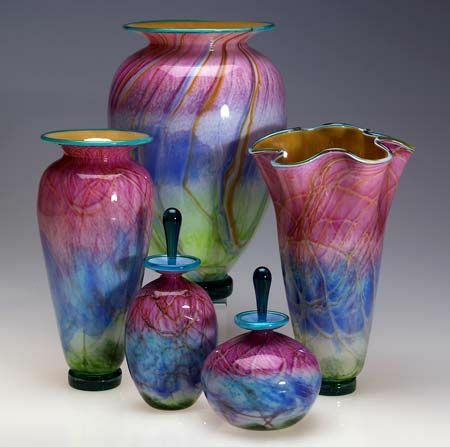 Nourot Art Glass Studio was founded in 1974 by husband and wife Micheal Nourot and Ann Corcoran. The artists met at California College of Arts and Crafts (CCAC) in Fall 1973. During his time at CCAC, Micheal was part of a scholarship program in which he helped build the famed glass school at Pilchuk in Washington. There he worked along side the talents of Dale Chihuly and others. 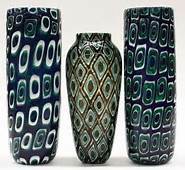 After graduation Micheal traveled to Murano where he spent a year studying glassmaking from Italian masters at the Vininni factory. Upon his return to California, Micheal was invited to teach in a glassblowing workshop taught by Marvin Lipofsky back at CCAC, where Ann Corcoran was then a student. And the rest is history. Ann Corcoran Nourot, originally from New Jersey and a textile student at Rochester Institute of Design, had recently relocated to California and changed majors from textiles to Glass. The two quickly found love and shared a passion for forging their way in the Bay Area art glass world. Micheal's first hot shop was founded in 1972 in San Francisco's Ghirardelli Square. The original name of the studio was Micheal's Light Opera. Early works from this time period bear the signature "LO" for Light Opera, instead of the "Nourot" signature seen today. When it became time to relocate the studio out of San Francisco, Micheal's grandfather, a realtor in the historic nearby town of Benicia, helped Micheal to find a new home for the business. The abandoned warehouse on the 600 block of East "H" Street in Benicia, once part of the Yuba Manufacturing Company, became the perfect location to move what would become Nourot Glass Studio. The pre 1900's complex was once home to a pattern and casting works, which made equipment for gold mining and dredging. Micheal and Ann purchased the building and moved the studio in 1974, the same year they were married. The couple built furnaces based on designs Micheal brought back from his training in Italy. That year Micheal also started batching his own glass formulas, using the techniques learned abroad. Building on designs he had begun back at Light Opera, the couple continued to use enamels on cullet melted clear glass, as well as other colored glass formulas. Nourot glass became especially well known for it's red glass, a color difficult to produce with consistent results. These early years produced some of the most interesting and beautiful work to be made by the Nourot studio. The early works of Nourot Glass were marketed by the couple, and also with the help of wholesale representatives in Los Angeles and Dallas. However, the Nourots quickly found they wanted to "be their own boss" and the American Craft Enterprises Shows provided the perfect avenue. 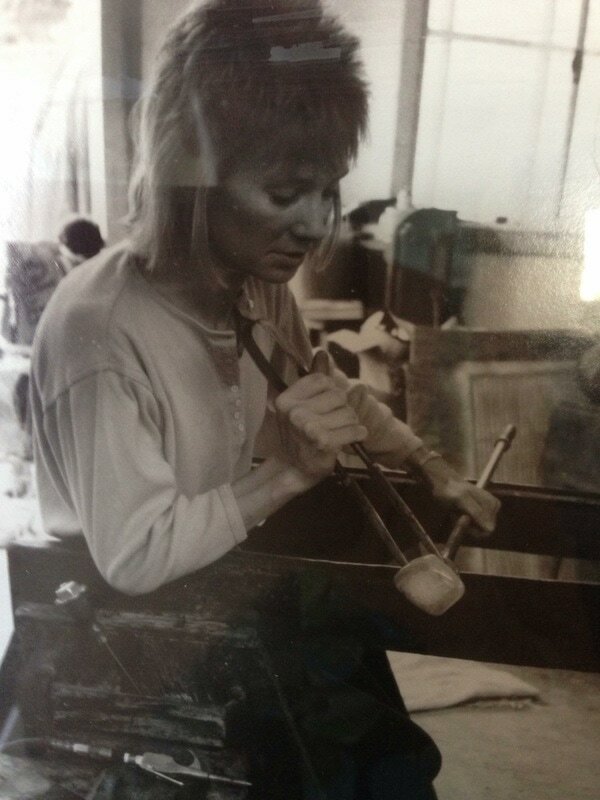 From 1976 onward, Craft shows became the main way the studio met gallery owners and wholesaled their pieces. As the American art glass movement grew, new studios and artists multiplied. The unique formulas pioneered by Nourot are what eventually set the studio apart from dozens of other Bay Area studios who followed in the 1980's and 1990's. Micheal began perfecting his red glass techniques while completing a commission for George Lucas' Skywalker Ranch. During this time he began to combine the red he had been melting for years with the opaque white glass. Micheal upheld the story that the "secret formula" for his red glass was gained in Murano through friendship with workers at the Vinnini factory. 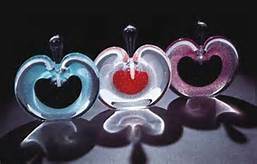 While melting his perfect red consistently was difficult, even harder to master, however, was the "silver luster" glass that he then began using with the reds. Cased glass like the studio produced gave many technical stumbling blocks. The clear, red, opaque, white, and red formulas had to be compatible. Many of the patterns Nourot Glass collectors know today, including Red Satin, Scarlet Nova, Red Flash are the result of Nourot Glass's mastery of these challenges. The studio remained at the Yuba until 1987 when the Nourots partnered with the Smyers family to purchase the building across the street. The two companies set up separate shops in the new building at 675 East "H" Street and started producing glass that same year. The "old Yuba" as it was lovingly known, then became home to a succession of other artist studios until the eventual destruction of the buildings in 2004. The summer of 1987 and Pope John Paul II's visit to San Francisco brought one of the biggest commissions from that time period. Nourot Glass created many pieces for the Mass held at Candle Stick Park, including communion dishes and paperweights to hold down the prayer cards in the gusty Candle Stick. Micheal was particularly fond of telling the story of how he blew a platter for the Pope's hat to rest on during the mass. In addition the "Pope Job" as the Nourot's called it, other high profile commissions of the time period included Presidents Reagan and Clinton, George Lucas, Bechtel, Lockheed, Clorox, and others. At times the studio made lighting for restaurants and casinos, gear shift knobs for classic cars, and other odd commissions, all the while continuing to make signature works and one of a kind series that explored new ideas. Still, the majority of the studio's work was sold to the public, either through retail galleries across the nation, or from the gallery at home in Benicia. Micheal and Ann both enjoyed getting to know their collectors and continued to host their well known twice yearly Open House Sales through 2016. In 1994 the Glass Art Society conference was held in Oakland California. At that time Zellique Art Glass also shared the end of "H" street with the other studios. Famed Italian glass master Lino Tagliapietra visited Nourot Glass and did demos in the studio with Dante Marioni assisting, a huge honor in the glass community. 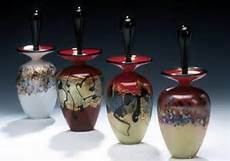 In an anecdote often repeated by Micheal Nourot, Murano native and lifelong glassmaker Lino Tagliapietra said during his visit "Micheal, your red, it's the best!" The Nourot's work was also displayed in the Smithsonian Museum in Washington DC during this period. President Bill Clinton and his wife Hilary gifted several of the Nourot's perfume bottles to various dignitaries in the 1990's. The new mellennium saw many changes in the world of glass and in the evolution of Nourot Glass Studio. In 2004, the Nourot's son Nicholas began working full time as a glassblower for the studio. The next 10 years saw a shift away from large crafts fairs, and kept the family closer to home. Micheal began to experiment with slumped glass projects, which were easier for him as his health deteriorated. During this time period the studio also completed a large lighting installation for the Rotunda building in downtown Oakland. In 2014 Micheal and Nicholas worked together with several other Benicia Artists on an installation for the new Community Center. It was a point of pride for Micheal to complete this work for his city, which for many is synonymous with the Bay Area glass scene. Please see the short documentary produced to memorialize this work on our videos tab. Nicholas, the current owner of the newly named Nourot Art Glass, continues the tradition of art glass in Benicia. Nourot Art Glass now has a beautiful new gallery space on First Street in downtown Benicia, while it's works are produced off site in rented studios. Many of the next generation of artisans do not keep furnaces of their own, which must be stoked and worked constantly, due to the extreme cost of energy and materials. For many in the new millennium the business model of studio glass has evolved in this way. What remains the same it that no two pieces made by hand using the centuries old techniques are ever exactly duplicated.